This post is sponsored by Maple Leaf Farms in conjunction with #CookoutWeek. All opinions are my own. 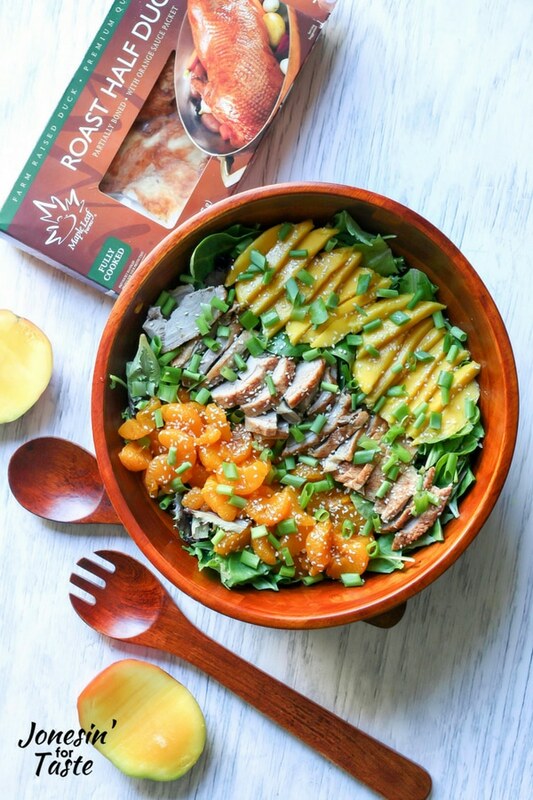 Enjoy the flavors of duck with mandarin oranges and fresh mango slices on a bed of spring greens and topped with a simple sesame dressing. In my opinion, roast duck is a richer version of chicken thighs. If you love chicken thighs, you’ll love roast duck. 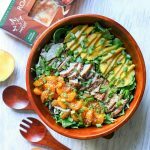 Because duck has so much flavor it holds its own with other strong flavors but also pairs well with milder flavors like those in this salad. 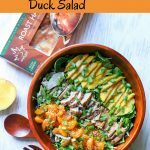 If you’ve ever wanted to try duck but have been too unsure of how to cook it or what to make with it this is the recipe for you. 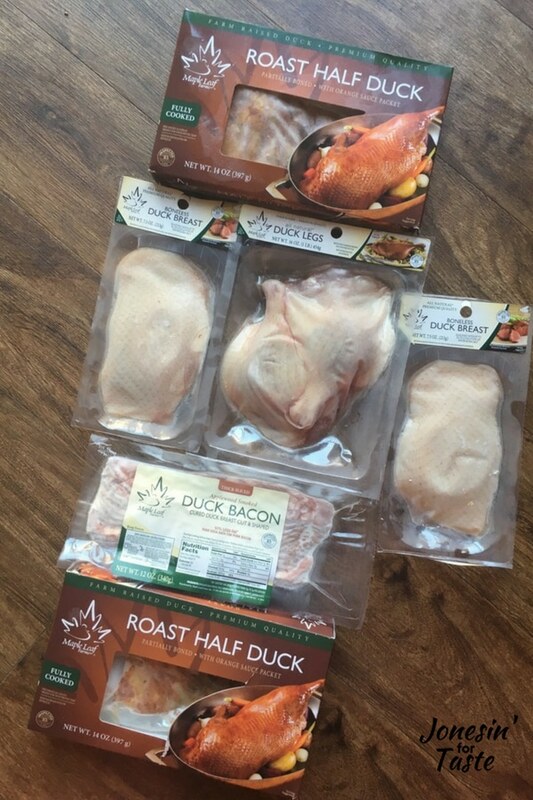 Maple Leaf Farms is a great place to buy duck for the newbie with a great selection of duck products. They have been in business for over 60 years since 1958! All of the ducks are raised on family farms and eat an all natural diet. Their focus is environmental stewardship and animal well being. Seriously, they are such a great company! For the duck novice their roast half duck is a great option. It’s already cooked so you can experience the wonderful flavors of duck without worrying about getting the actual cooking of it right. The roast duck comes with an orange glaze packet. Follow the directions to reheat the duck and add the glaze. It’s so good! 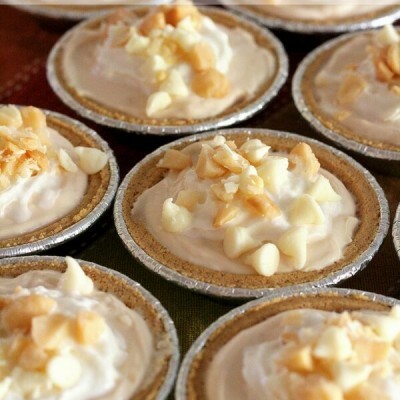 The Maple Leaf Farms Instagram page shows off more great recipes and fun behind the scenes. Make sure to stop by and tell them hi! 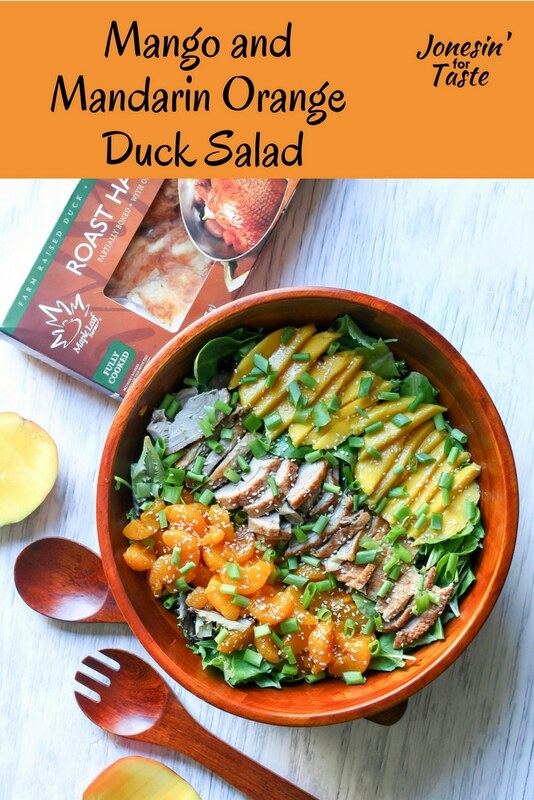 I decided to add our roast duck to a spring salad mix and added some sweet mangoes and mandarin oranges to counter the richness of the duck for my family who was trying duck for the first time. You can eat roast duck cold and it tastes great! That’s actually what I did for this salad but you could also serve the duck warm on the salad. Although you could peel a million mandarin oranges for this dish, I prefer to go the canned route. I always look for mandarin oranges in light syrup or in juice. Rinse the mandarin oranges under a gentle stream of cold water to rinse off some of the extra sugar for the best flavor. When making the salad dressing, make sure to mix the dressing up really well right before you pour it. One time the dressing had sat for about 10 minutes and my husband swirled it without really mixing it and all the sugar sat at the bottom. It tasted really funny and when I looked at the bowl I knew why! Other options that would work well in this salad? Kale would make a great salad substitute and would keep even better for leftovers (not that I’m saying you’ll have any leftovers). If you wanted an additional crunch you could add fried wonton strips. Fresh cut pineapple would also make a great addition to this salad with its wonderful acidity. This salad would definitely be a stand out at any cookout! The flavor combos are amazing and from my brief survey, I think most people haven’t ever tried duck. 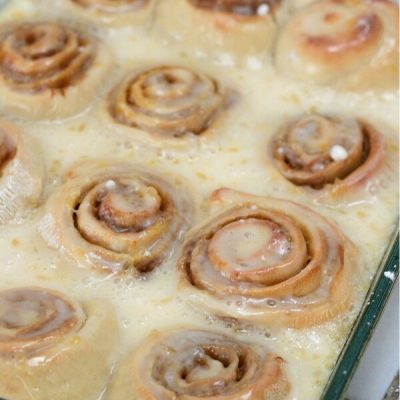 Other unusual recipes to help you shine at the next cookout? 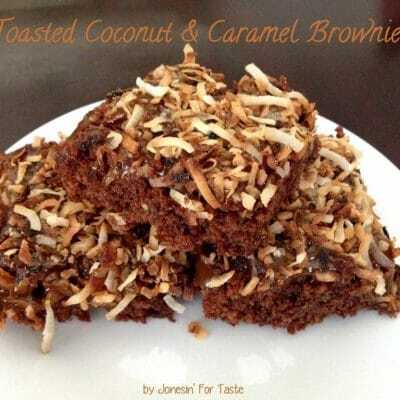 Make sure to check out the rest of today’s recipes down below the recipe! And if you missed yesterday’s recipe make sure to stop by and let me know what you think of my Spicy Jalapeno Black Pepper Turkey Burger. Prepare roast duck according to package directions. Cut around bone and slice. Meanwhile, make salad dressing by mixing all ingredients in a bowl and mixing well. 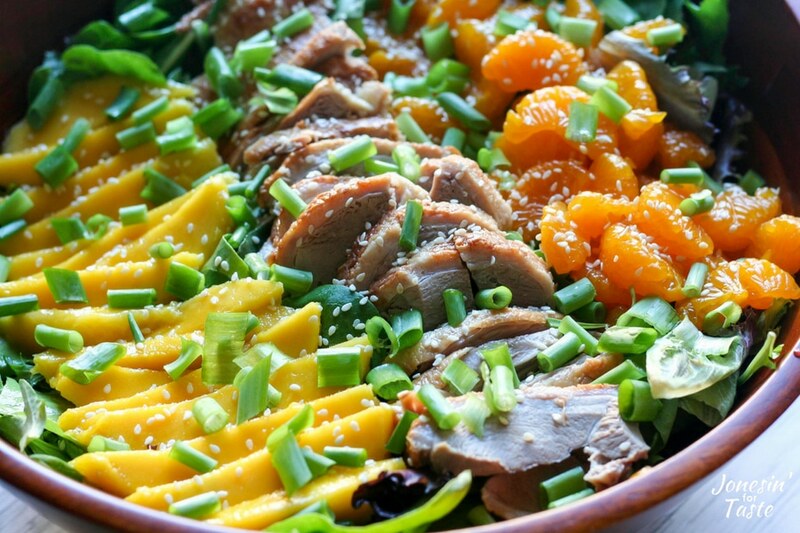 In a large bowl, add spring salad mix, sliced mangoes, mandarin oranges, and sliced roast duck. Sprinkle green onions and sesame seeds over the salad. 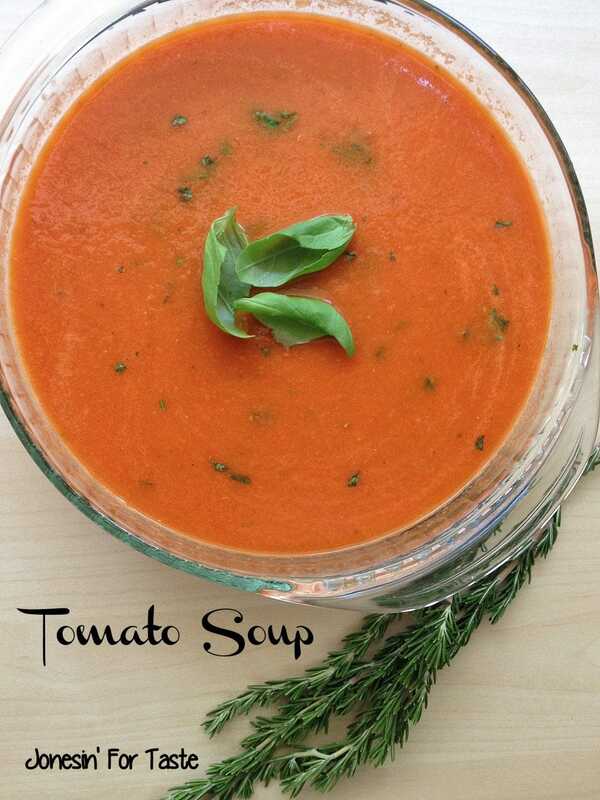 Just before serving, give the salad dressing another good mix to make sure no sugar has settled to the bottom. Pour the salad dressing over the salad and toss to coat. These are the perfect flavors to match with duck. This salad is beautiful.